Lenovo K520 spotted on GeekBench. Home Lenovo Lenovo K520 spotted on GeekBench. 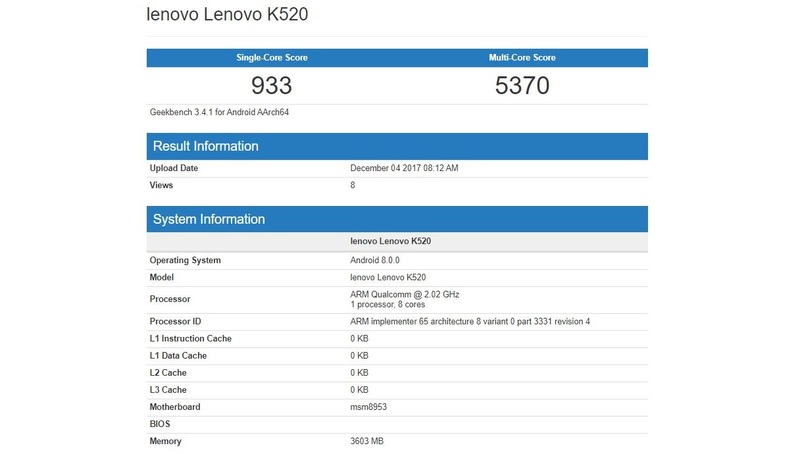 Lenovo new device with model number K520 has now been spotted on Geekbench Benchmarks.We can expect it to be next K-series smartphone but not sure about that. As per listing on GeekBench, the Lenovo K520 is powered by Snapdragon MSM8953 aka SD625 chip clocked at 2.02 GHz coupled with 4GB RAM. It is running on latest Android 8.0 out of the box. The Lenovo K520 scored 933 on single core test and 5370 on multi-core test.it might be the successor of 2016 launched Lenovo K6 Power which was powered by SD430 chip.The upcoming Lenovo K520 is rumored to be priced below $500. Previous articleSamsung Galaxy S9 live images and key specs leaked. Next articleAlleged HTC Ocean Harmony passes through 3C certification in China. Lenovo announces the new flagship Lenovo Z6 Pro with quad-cameras in China. Lenovo new teaser reveals the key specs of the upcoming Lenovo Z6 Pro. Lenovo quietly launches the new Lenovo K6 Enjoy in China.